Adapted for the big screen, Max Brooks’ novel World War Zloses its oral history style and a pile of supporting characters instead opting to focus its storytelling on one man and his race to save his family as the world is gripped in a mysterious, deadly virus-fuelled zombie apocalypse. As a result, the charm of the original book is lost. In the book, the oral history of the war against the zombies is told by many people on a number of continents while in the film one man hunts down the solution to the epidemic. The film adaptation also uses many popular movie conventions. Viewers will recognize familiar notes from your average action thriller only this time with zombies. And this is the thing: if you like zombies you’ll enjoy the film. If you know the World War Znovel inside and out you may enjoy it less since it bears little resemblance to the novel. But if you don’t like zombies steer clear because there are a lot of them. These aren’t the most unnerving or even the most disgusting of gross-out zombies they are just your modern, garden-variety zombies. But if you’ve watched a lot of zombie movies you’ll know that there are zombies and then there are zombies. Over the years, zombies have undergone a transformation. Back in 1932 you had Bela Lugosi in White Zombie which featured a voodoo witch doctor on a Haitian plantation creating zombies with a magical potion. In the highly influential 1968 Night of the Living Dead the zombies were reanimated corpses brought back to “life” by a satellite returning from the planet Venus emanating mysterious radiation. The popular fast-moving infectious viral zombies were introduced into the fictional zombie genre in 2002 with the film 28 Days Later. The zombie as a category of movie villain has in many ways grown up with the culture and with the audience, shifting and changing as the audience matured. The modern development of zombies in fiction really took off with George A. Romero’s Night of the Living Dead and captured the minds of the young baby boomer segment of society. In that film, zombies went from being supernatural to becoming a scientific plague. However, the zombie still represents a fear of the unknown and a fear of loss of self and loss of control over our body. With the advent of the reanimated corpse in Night of the Living Dead the added fear of death is brought into the mix creating a cocktail of all things horrifying to people in general and baby-boomers in particular. But what about the Christian, what about the baby-boomer Christian? Is there really anything to be frightened of when it comes to these things? Zombie-like behaviour does occur in living organisms in nature in peculiar ways but is it something the Christian should be anxious about? World War Z is full of tribulation, distress, famine, and danger; it’s full of death and zombies, which would be included in the “anything else in all creation” part of Paul’s words of comfort. Is World War Za scary movie? Some will find it frightening and unsettling, but there are more frightening and more unsettling zombie movies out there. World War Zisn’t technically a modern horror film. It would require more blood and guts to garner that distinction. But it does exploit genuine fear as the story unfolds. The plot centres on a former United Nations employee Gerry Lane (Brad Pit), a skilled and intrepid investigator who is working to beat the clock not so much because he’s afraid of Zombies but because he is afraid of losing his wife and kids to the gnawing teeth of the zombies. This is the film’s strength. It presents a genuine human fear, the preservation of the family unit, a fear that transcends the zombie genre and could be found in a thousand difficult and dangerous situations. 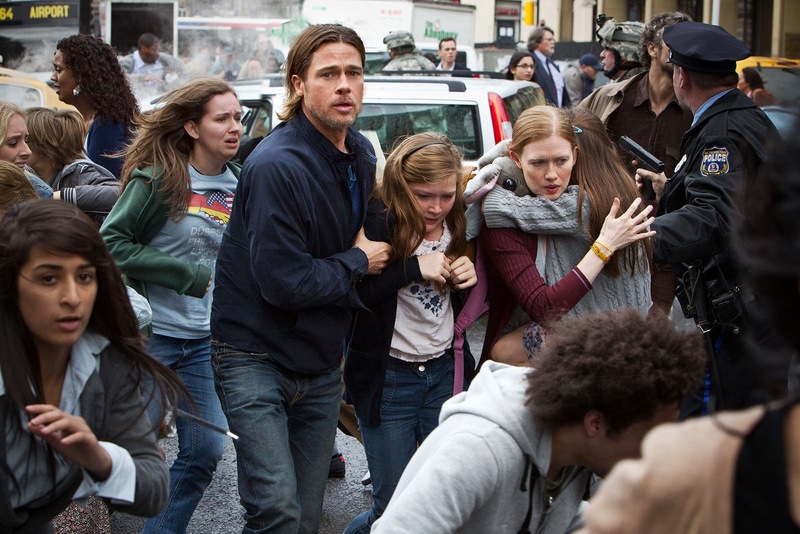 This is the true fear at the heart of Marc Forster’s film adaptation of World War Z. The unexpected gem hidden in this film is the Lane family – a family where the mom and dad love each other, raise their children together in a loving and firm way, and where the children love each other and honour their parents to the best of their abilities. The drama doesn’t come from a family melting down under pressure but rather from a family strengthened in the face of hardships and adversity. This is a relatively rare thing in Hollywood and the Christian who views this movie will find this interesting. While other films downplay the cost of human life in the midst of disaster and tribulation World War Zgoes out of its way to give glimpses into the sorrow of losing family members to tragic circumstances. People in the film act the way people actually act in adversity: some people pray and act virtuously while others act poorly and sinfully as the fabric of society comes apart. Some stand together while others act alone. Survivors grieve the loss of the ones they love and do what they can with what they have. These are all details generally glossed over in recent CGI blockbusters like Man of Steel. 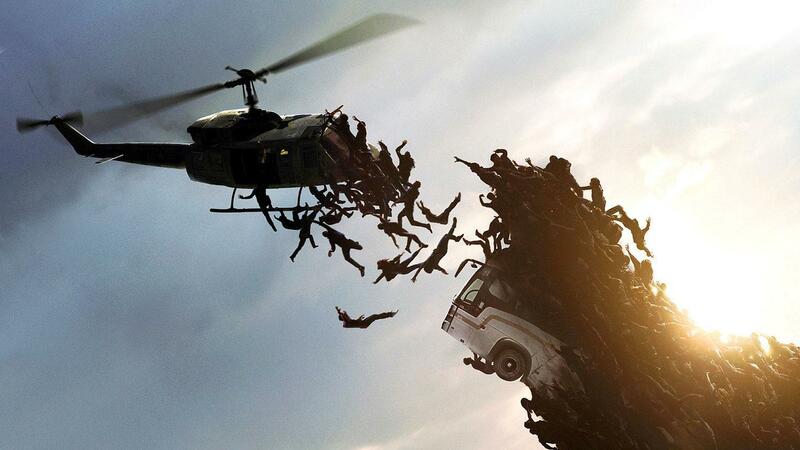 In that film, as in World War Z, a central character sets out to save the world. Unlike Man of Steel, in Gerry Lane you have a man willing to die to save the ones he loves, a man willing to die for his bride and the children of that bride. Gerry Lane is not indestructible the way Superman is, Lane is a man who lives with the reality of death shambling nimbly alongside him at every turn. The Christian may well see in World War Zthe picture painted by St. Paul for husbands and wives when Paul writes in Ephesians, “Wives, submit to your own husbands, as to the Lord. For the husband is the head of the wife even as Christ is the head of the church, His body, and is Himself its Savior. Now as the church submits to Christ, so also wives should submit in everything to their husbands. One last thing to contemplate as World War Zjoins the ranks of the multitude of other zombie flicks out there. Current zombie fiction portrays the idea of the dead rising from the graves as a horror, laying out stories where the living are transformed practically in the twinkling of an eye into mindless decomposing flesh-seeking menaces with no soul, personality or conscience. For the Christian there may be a nagging unease floating at the edge of all this because the Christian has a different hope for the day that the dead rise from their graves: This hope of the Christian is centred on Jesus and His resurrection from the dead on that first Easter Sunday. Saint Paul describes the last day, the day that the dead rise up, as one on which the living will “Be changed. In a moment, in the twinkling of an eye, at the last trumpet. For the trumpet will sound, and the dead will be raised imperishable, and we shall be changed. For this perishable body must put on the imperishable, and this mortal body must put on immortality.” The Christian hope is that the body we now have will not be a rotting mindless decomposing mess of disease and pestilence but rather will be one that is "transformed ... to be like [Jesus’] glorious body, by the power that enables [Jesus] even to subject all things to Himself.” This is a very different picture from that of the fictional zombie apocalypse of pop American culture. As stated before, if zombies aren’t your cup of tea you’ll want to skip this one. If however you enjoy zombies and zombie fiction then World War Zmay be just the movie for you. Either way, remember that nothing will be able to separate you from the love of God in Christ Jesus our Lord—not even zombies – but more importantly, not even all the very real world dangers you may face in life.